What are Diatoms? 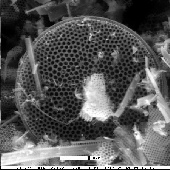 Diatoms are unicellular organisms that build delicate silica shells called frustrules. Diatoms are extremely abundant members of both marine and fresh-water ecosystems, where they are major primary producers, serving as a rich food resource for other animals. They are also economically important, used as filtering agents, in paints, and as abrasives in many cleansers, including toothpaste.